The two-seat RV-9A is one model in a series of kitplanes designed by Van’s Aircraft in Oregon. All of the RV series are low-wing aircraft of traditional metal construction. Most come in two varieties: tailwheel, and nosewheel (known as the “A” model). The other major choice is tip-up or sliding canopy, but the variations in each plane’s configuration are limited only by the builder’s imagination. The RV-9(A) is different from its predecessors in that it is not designed for aerobatics. Some see it as a particularly well-rounded RV, as the longer wings reportedly contribute to greater stability, but the handling “feel” of the RV series is still present. The RV-9(A) sacrifices a few knots of top speed compared to the other models, but also stalls slower-which can mean easier to land and less energy on impact in the event of a crash. The long wing is reportedly quite happy at high cruising altitudes. One local builder often reports his “fun flights” around the area at fuel flows in the 3-4GPH range, at a speed which still beats most training/rental airplanes. 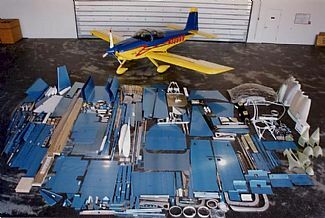 RV series aircraft are the most popular kitplane produced, with over 6,000 aircraft completed and flying around the world (the total experimental fleet is around 30,000 in the USA). There is also a strong support network through local builder groups, such as the Minnesota Wing, and online sites like RivetBangers and Van’s Air Force. This network of people with experience is part of what drew me to this series of aircraft; knowing that other people had been able to finish the project, and were willing to help those working on their own. I am just starting an RV9a, located in Apple Valley, MN. I would like to discuss your project and some of the things you have run into if possible. The architect of the line of Van’s aircraft, Richard VanGrunsven, designed the RV-9 as a departure from the concepts of the earlier RV series. The earlier members of the RV series, starting with the single seat RV-3, were all designed to have light handling, aerobatic capabilities along with fast cruise speeds and STOL capabilities. The RV-9 was designed from the start as a two-place, side-by-side, touring aircraft and as such it forgoes the aerobatic capabilities and the lighter handling for more stability and economy. As such the design horsepower is 118-160 and the prototype was flown with a Lycoming O-235 powerplant of 118 hp (88 kW) as a proof-of-concept for the lower horsepower. 27 queries in 0.204 seconds.